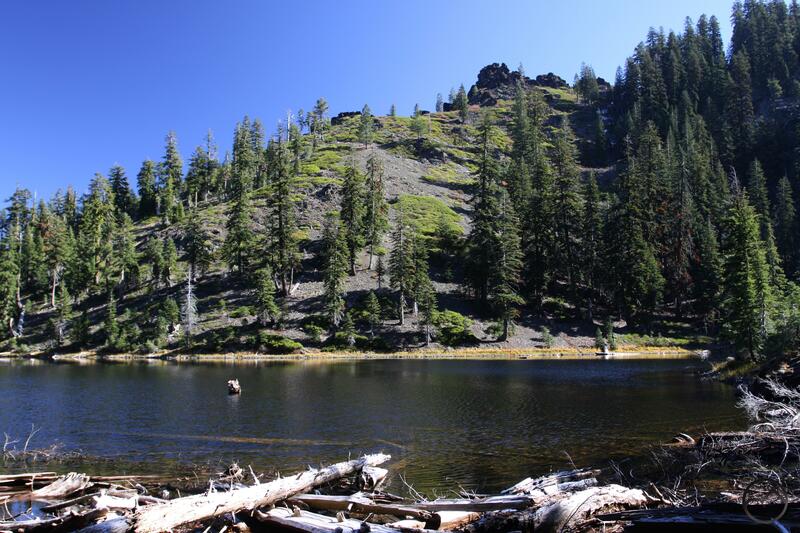 A short, easy trail into the Trinity Alps Wilderness, leading to a small but very scenic lake backed by a tall cliff. Great views abound along the Trail. One of two hikes beginning at the same trailhead, the Hidden Lake Trail is probably the easiest trail in the Trinity Alps. Only a mile long and gaining only 500 feet, it is a quick trip into a small but very scenic lake located in the remote, northeast corner of the Trinity Alps. 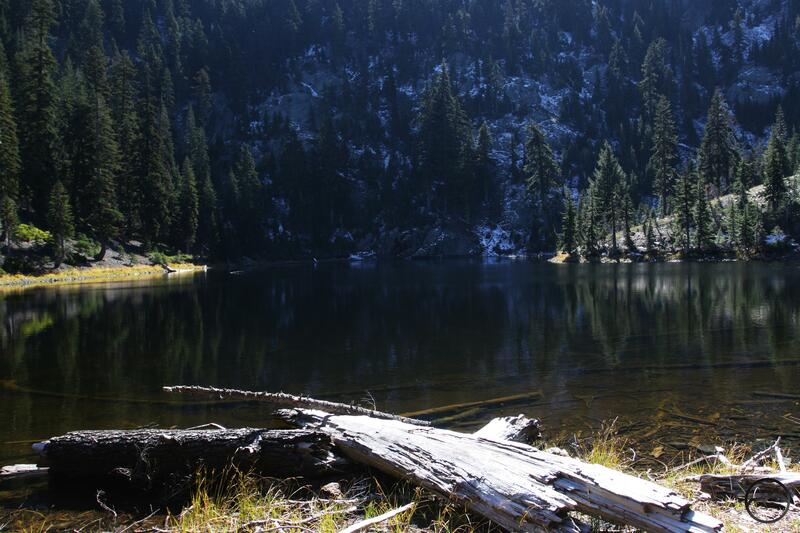 Hidden Lake, though small, is the headwaters of the East Fork of the South Fork of the Salmon River. The diminutive lake is located on the divide between the Salmon and Scott Rivers. Though not particularly deep and only consisting of three acres, the lake still boasts an impressive cliff at its southern end. Indeed, even though the lake and the trail are both diminutive compared to the mighty giants in the interior of the Trinity Alps, they are a compact example of what many of the great trails in the Trinities have to offer: superb vistas, clear alpine lakes and awesome, craggy cliffs. However, given Hidden Lake’s remote location, it may best be appreciated in the afternoon, after a morning spent hiking into the South Fork Lakes, a trip that departs from the same trailhead as the route to Hidden Lake. After the heavy exertion climbing up to the South Forks, an idle afternoon watching the sun light up Hidden Lake’s southern cliff is a perfect end to a wonderful day spent in the Trinity Alps. Scott Mountains from the Hidden lake Trail. The Carter Meadow Summit Trailhead is one of the more complicated trailheads in the Trinity Alps. After a short descent from the trailhead, there is an immediate junction of four trails. On the far right the PCT heads off toward Canada, crossing the Cecilville-Callahan Road and climbing into the Russian Wilderness. Just to the left is a trail that connects the trailhead to Carter Meadows and the nearby Hidden Horse Campground. 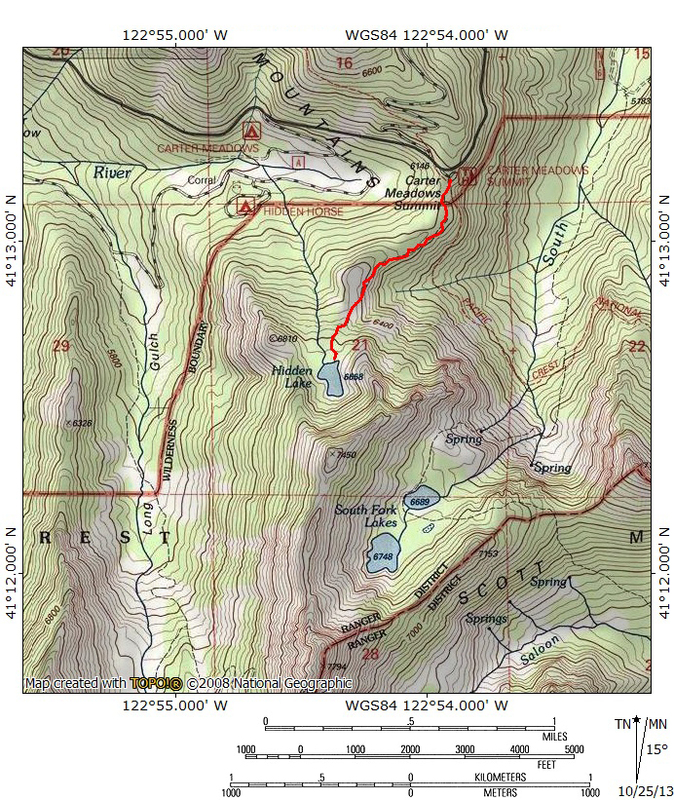 On the left the PCT extends to the south, often used as access for the South Fork Lakes, which lie on the other side of a large ridge from Hidden Lake. 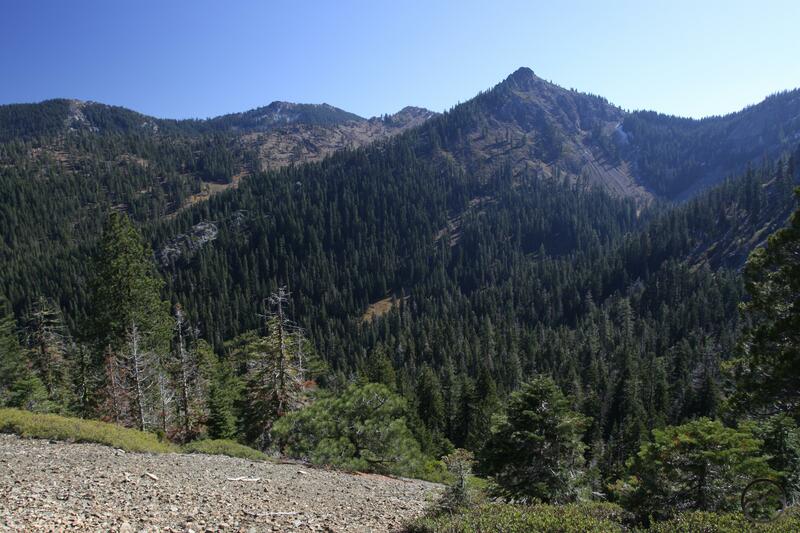 At the Carter Meadows trailhead, the PCT is completing its 18 mile traverse of the northeast corner of the Trinity Alps. Having sorted out all of these trails, this leaves the Hidden Lake Trail, which sets out due south from the trailehead. The path climbs moderately through forest cover for a short distance. After going south for a short distance the trail bends to the west and drops below the crest of a ridge. The forest gives way to brushy terrain, consequently revealing excellent views to the east. The crest of the Scott Mountains extends to the east where, after 20 miles, they terminate at underrated China Mountain. Much of the terrain covered by the South Fork Lakes Trail is visible from here, including the dramatic basin from which the South Fork trail must climb out of to reach the lakes. Be thankful no such climb is necessary to reach Hidden Lake. Enjoy the views for about 0.5 miles until the trail reaches the top of a ridge. The distinctive turret above Hidden Lake. From the ridge, the path continues to the south; now climb at a steeper grade. This is the final push up to the lake. The brushy terrain gives way forest once again. A few switchbacks moderate the climb before the trail finally levels off and ends at the north end of Hidden Lake. The small, 3 acre body of water extends southward. At the far end a large 700 foot cliff rises out of the water and soars high overhead. The east side of Hidden Lake is overshadowed by a high bluff topped with a small turret of dark rock. Trails wrap around the east and west side of the lake but they do not connect because of the rugged nature of the cliff. Campgrounds abound but the best is just to the right of the where the trail finally arrives at the lake where there is a small patch of meadow and nice, open forest. This is the perfect spot to relax and enjoy the view of both the lake’s impressive cliff and the east side’s interesting turret., particularly in the afternoon. It is amazing that such a great spot is so easily accessed. 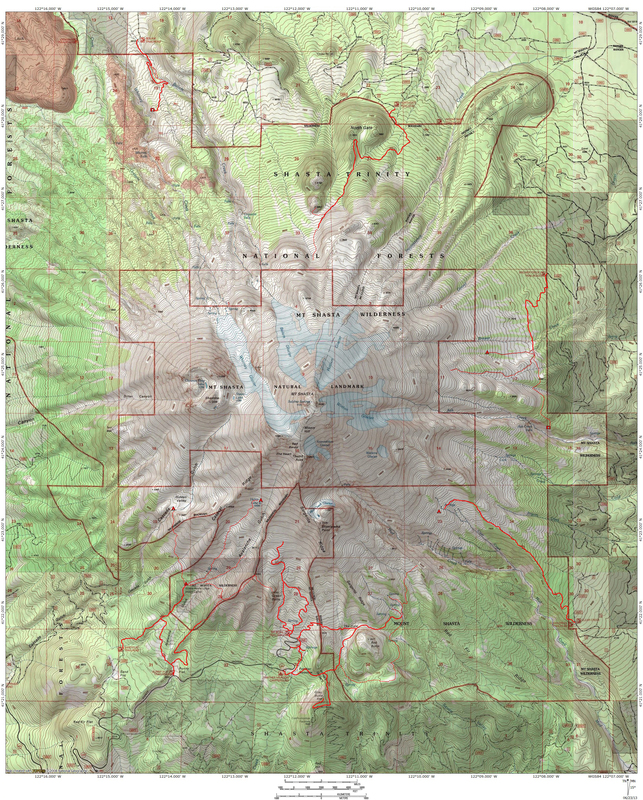 From Mount Shasta City, drive north on Interstate 5 for 12 miles. Take the Edgewood/Gazelle exit, turn left under the freeway then immediately turn right onto Old Highway 99. Proceed north for 7 miles, entering the small community of Gazelle. Turn left onto the Gazelle-Callahan Road. Drive this scenic road for 24.8 miles, continuing another 2.1 miles after it merges with Highway 3. At the north end of the small village of Callahan, turn left onto the Callahan-Cecilville Road, which is also named Forest Highway 93. Continue for 11.8 miles on this interesting road to the signed turnout for the Carter Meadow Summit Trailhead.